Medical robots, a technology once considered the realm of science fiction and the figment of an overzealous imagination, are now a reality. The industry is worth billions already and growing rapidly. Here, Graham Mackrell, managing director of high precision gearing specialist, Harmonic Drive UK, explores the latest trends in the field. Although the figure varies considerably between different market reports, most experts value the medical robots market between $2.67 billion and $4.2 billion as of 2014/15, according to research firms IndustryARC and MarketsandMarkets, respectively. The expected future growth is equally as staggering. With a compound annual growth rate (CAGR) of 22.2 per cent per year, the market is expected to reach $11.4 billion by 2020. Medical professionals use robots for everything from surgery and rehabilitation, to non-invasive, general hospital and pharmacy applications. North America accounts for 62 per cent share of the medical robots market, Europe for 24 per cent of the market, with Asia Pacific and the rest of the world bringing up the rear. This is not surprising, considering that the U.S. spent $8,745 per capita on healthcare in 2012, the highest amount of any country in the developed world, according to a recent report by the Organisation for Economic Co-operation and Development (OECD). So why the big push towards medical robots? Well, despite the political rifts often caused by social policy on healthcare issues — whether its Obamacare in the US or the National Health Service (NHS) in the UK — there is no doubt that healthcare providers are under increasing pressure to cut costs, deliver higher return on investment and improve safety. Cue robots. 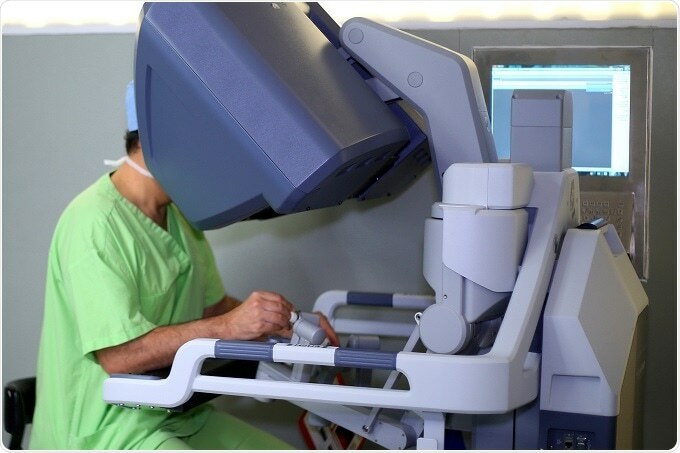 Designed to improve a surgeon's accuracy, comfort, dexterity and stamina, robot-assisted surgery has become popular for minimally invasive laparoscopic, orthopaedic and neurosurgery procedures that aim to reduce risks and improve recovery times. Such keyhole surgery relies on robots that can work through very small incisions, often alongside other instruments, quickly and accurately. There are three main types of surgical robot: autonomous, dependent and shared-control. Writing in Cancer Control, journal of the Moffitt Cancer Center, the authors Doulgeris, Gonzales-Blohm and Filis et al, explain that "autonomous systems reproduce programmed motions ... dependent systems [are where] the surgeon maintains full control of the system at all times ... [and] shared-control systems are a hybrid. "For example, a shared-control application could involve a passive arm hooked up to a surgeon's hand that moves only when permitted, but yet it can filter unwanted motions such as hand tremors." Despite the benefits of the technology, a surgical robot still faces its biggest challenge when it comes to navigating its way through very small incisions and working around obstacles in its path. Acting in such confined spaces, robots have to allow surgeons to grasp, probe and pull tissue without causing damage to the surrounding body. Robotic manufacturers typically overcome this problem by including more than six degrees of freedom (DoF), the joints around which a robot can articulate in any given direction. Although this provides the freedom of movement to navigate difficult spaces, it still does not cater for the large variation in applied-force required to operate on everything from soft brain tissue to hard bone. To solve this problem, at Harmonic Drive, we have spent the last forty years developing increasingly more compact, high precision and high power gearing systems for robots. Over this time, we have witnessed the trend for smaller and lighter motors, drives, controls, gearing systems and sensors. At the same time, the demand for powerful robots has gone up. In the last decade alone, for example, we have seen a 90 per cent increase in the torque-to-weight capacity of our gearing component sets, rising from an average of 310Nm/kg to an extraordinary 580Nm/kg. One of the reasons why Harmonic Drive gears have been chosen by the leading surgical systems is because we've designed them around six core principles. The gears must provide a high level of accuracy and repeatability; they must produce zero backlash; deliver a high single-stage gear ratio and deliver a high-torque output, all of which must be packed into a compact and lightweight form factor. Original equipment manufacturers (OEMs) developing surgical robots should consider not only accuracy and repeatability, but also look at the power capacity as well as how frequently the equipment will require maintenance. A robot with a low mean-time-between-failure (MTBF) requires maintenance more frequently, raising operational expenditure, something that many healthcare organisations are under pressure to reduce. As the sustainable uptake of surgical robots continues, perhaps it will not be long before this once-imaginary technology gains acceptance and the overzealous minds among us can once again begin to imagine the next great challenge.